Last night I was able to game well past my bed time in a Savage World’s Shaintar adventure hosted by Stephen Dragonspawn called “Fire in the Darkness.” It was my first experience with a live Savage Worlds game and, while the gods of RNGiness did make it a little weird, it was a long enough session for me to get a really good first look – along with very good GM explanations – at the core ruleset. Beyond these goals, I also had a good time and enjoyed Stephen’s adventure a great deal. I know that Stephen is running this again, so I will not post any spoilers. Please don’t misinterpret this as a casual disregard for the nuances of the adventure – it was nicely done and plenty of fun – and I don’t want to ruin it for anyone else. I mentioned the gods of RNG and they reared their multiplicative heads early and often. 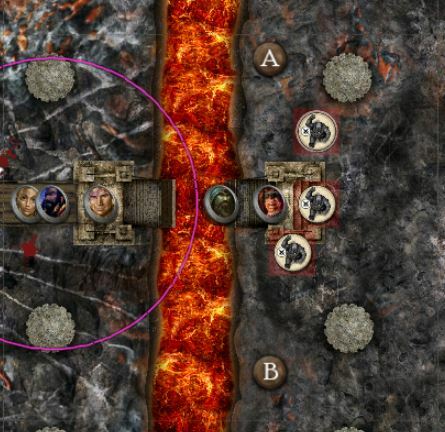 On the second round of combat – what was perhaps 10 minutes into the game – a gargoyle hit the party’s Orc Druid with an outrageously lethal amount of damage. 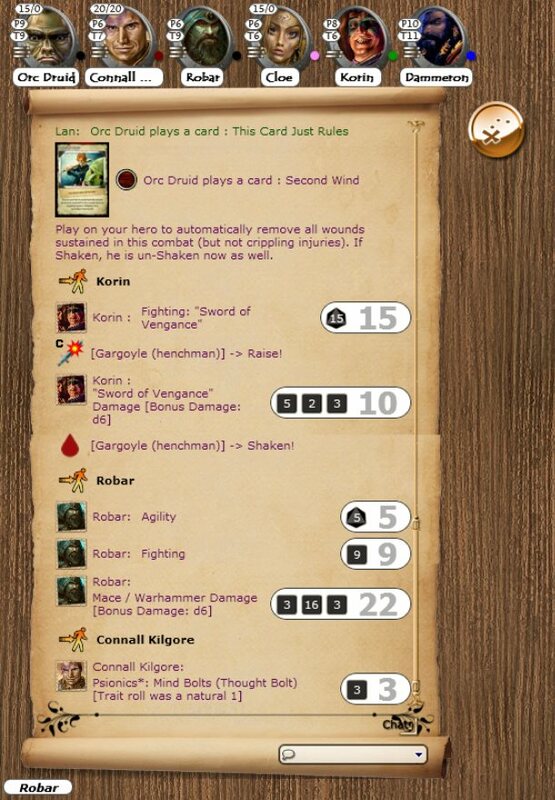 The druid played an adventure card which negated all combat damage thus far and walked away without a scratch, and dryly commented that he had never had to play an adventure card so early. I looked at my adventure cards and nary a one would have saved me, so RNG cut both directions here – which as pretty cool. My character Robar’s first attack was effective! As the night went on, we had the good fortune of drawing a lot of Jokers during combat, so we had a fairly strong (a bit short of outrageous) influx of bennys. Because we knew the timeline (4 hour game session), we were able to be fairly free with how and when we spent them, so we moved along fairly quickly. By the end of the evening, I certainly had noticed how quick and deadly combat encounters were compared to D&D 5e. Ganging up bonuses combined with well-timed uses of bennys illustrated the effectiveness of team-play. The Wild Die helps give combat the proper sense of the chaotic unpredictability of battle – and maybe happy rush of adrenaline or happiness or fear that one should have when something unexpectedly good or bad happens. When the Wild Die went off and a combatant was cut down with a mighty blow, Stephen urged the players to describe the blow. I thought this a little strange at first, but came to recognize that he was prompted for some role playing and doing it at a good time, when the player was flush with a bit of excitement or elation. There is often a discussion about what happened after a crit in D&D with the players expanding the narrative details, so asking for an explanation from the player is rather clever. I may have to steal that :). All in all, my first impressions of Savage Worlds are very good indeed and I am starting to get excited about the prospect of running a campaign with the ruleset. Thank you, Stephen, for an excellent introduction to Savage Worlds!